Sensitivity is generally an issue in bioassays of prostaglandins and their synthetic analogs due to their extremely low concentration in vivo. To improve the ionization efficiency of limaprost, an oral prostaglandin E1 (PGE1) synthetic analog, we investigated a charge reversal derivatization strategy in electrospray ionization mass spectrometry (ESI-MS). We established that the cholamine derivative exhibits much greater signal intensity in the positive-ion mode compared with limaprost in the negative ion mode. Collision-induced dissociation (CID) involved exclusive neutral mass loss and positive charge migration to form stable cationic product ions with the positive charge on the limaprost residue rather than on the modifying group. This has the effect of maintaining the efficiency and specificity of multiple reaction monitoring (MRM) and avoiding cross talk. CID fragmentation patterns of other limaprost derivatives allowed us to relate the dissociation tendency of different neutral leaving groups to an internal energy distribution scale based on the survival yield method. Knowledge of the energy involved in the production of stabilized positive ions will potentially assist the selection of suitable derivatization reagents for the analysis of a wide variety of lipid acids. As an analog of prostaglandin (PG) E1, limaprost is a vasodilator that increases blood flow and inhibits adenosine diphosphate and collagen-induced platelet aggregation. With its modified structure, limaprost has a longer half-life and greater potency than PGE1 [1, 2]. Considering the very low daily dose (15–30 μg/day) and concomitant low concentration of limaprost in human plasma (Cmax ~ 1 pg/mL), the lower limit of quantitation (LLOQ) of an analytical method for pharmacokinetic studies needs to be as low as 0.1 pg/mL. Strategies to develop such a sensitive analytical technique generally involve the use of a high volume of sample or a complicated sample preparation procedure to increase analyte concentration. However, even with these strategies, a highly sensitive and specific method based on liquid chromatography tandem mass spectrometry (LC-MS/MS) remains indispensable. Accordingly, we have investigated the application of LC-MS/MS to the determination of limaprost in human plasma. Limaprost possesses a carboxyl acid group which readily forms a negative ion in electrospray ionization (ESI) for detection in LC-MS/MS. However, good chromatographic behavior requires an acidic mobile phase, which tends to decrease the ionization efficiency of carboxyl acid groups and thereby reduce signal intensity and sensitivity . Considering this restriction, improvement in the ionization efficiency of limaprost under acidic conditions via formation of nitrogen-containing derivatives is a logical solution. Since such limaprost derivatives favor positive ion formation in ESI-MS in contrast with limaprost itself, such a technique can be called charge reversal chemical derivatization. Traditional derivatization reagents for carboxylic acids that serve to introduce nitrogen include dimethylaminoethyl alcohol and dimethylaminoethylamine [4, 5]. When applied to the determination of PGs in plasma by LC-MS/MS, the detection limit of dimethylaminoethyl ester derivatives can reach as low as 20 pg per injection . However, carboxyl acid derivatives containing quaternary ammonium residues derived from acetylcholine, phosphatidylcholines, or sphingomyelin provide even more sensitive detection. For example, compared with the dimethylaminoethyl ester derivative of long chain fatty acids, the trimethylaminoethyl (choline) ester derivative afforded a signal intensity 8–12 times greater in the analysis of plasma samples . Such quaternary ammonium moieties can be introduced directly or subsequent to a coupling reaction through methylation of their trialkylamine precursors [7, 8, 9, 10]. Various derivatization reagents have been applied to introduce quaternary ammonium moieties to PG molecules [11, 12, 13], including N-(4-aminomethylphenyl)pyridinium (AMPP) [13, 14] and (2-(4-aminophenoxy)ethyl) (4-bromophenethyl)dimethyl ammonium (4-APEBA)  salts. Although improvement in ionization efficiency was achieved using these reagents [5, 13, 14], the cationic fragments used for quantitative analysis were derived from the derivatization reagent itself (Scheme 1) [15, 16, 17]. The PG moiety in such precursor ions is then lost as neutral mass and is no longer detectable. Meanwhile, precursor ions for either PGs or interfering molecules with the same molecular weight produce the same product ions making it impossible to distinguish an analyte from its isobaric interference and leading to cross talk between analytes sharing the same ion channel. From this perspective, derivatization can reduce the specificity of multiple reaction monitoring (MRM) in LC-MS/MS quantitation. 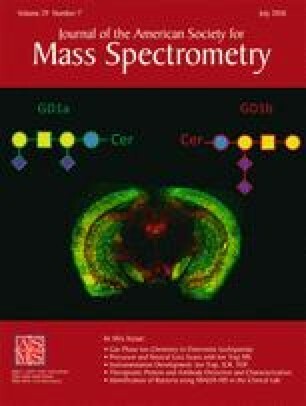 In contrast, choline derivatives of fatty acids not only produce an adequate MS signal in the positive ion mode but also a unique fragmentation pattern providing more information related to the analyte [18, 19]. This is because choline-derivatized fatty acids undergo both a neutral mass loss of m/z 59 (NMe3) and migration of positive charge . Recently, the quaternary ammonium reagent, cholamine (2a), was utilized as a derivatization reagent, isotopic labeling reagent [3, 20], and peptide tag  in ESI-MS analysis. Considering the coupling efficiency of the amidation reaction, this reagent is more suitable for derivatization of limaprost. In the present study, we produced cholamine derivatives of limaprost (1a-1b) to achieve charge reversal and improve ionization efficiency in the positive ion mode. We also produced some positively charged quaternary ammonium derivatives (3a-3f) and investigated their mechanism of fragmentation. The influence of the adjacent group was studied and evaluated from an energetic perspective according to the internal energy distribution scale of the limaprost derivatives. Synthesis of 2a and 2e were performed as described in previous reports [3, 20, 22]. The zwitterionic compound 3-((2-aminoethyl)dimethylammoniopropane-1-sulfonate 2c was prepared from 2b also using a literature procedure . Other chemicals were of analytical grade and purchased from commercial sources. The derivatization protocol was as follows: to an aliquot (1 mL) of an acetonitrile solution of 3 μM limaprost (1a) was added 100 μL aliquots of acetonitrile solutions of 1 mM N,N-diisopropylethylamine (DIPEA) and 1 mM 1-[bis(dimethylamino) methylene]-1H-1,2,3-triazolo[4,5-b]pyridinium 3-oxide hexafluorophosphate (HATU) and the mixture incubated for 15 min at ambient temperature. A 100-μL aliquot of an aqueous solution of 1 mM derivatization reagent 2a-2e was then added, and the mixture was incubated for 1 h at ambient temperature. The large excess of derivatization reagent ensures a nearly quantitative conversion of limaprost (Scheme 2). Chromatography was performed on an Agilent 1100 HPLC system (Agilent Technologies, Santa Clara, CA, USA) using a Zorbax Eclipse Plus C8 (2.1 × 50 mm, 5 μm) column at ambient temperature. The mobile phase for gradient elution utilized 0.1% formic acid in water:acetonitrile (98:2, v/v) (solvent A) and acetonitrile (solvent B) delivered at a flow rate of 0.3 mL/min. Experiments were performed on a QTRAP 6500 mass spectrometer equipped with an ESI source operated in the positive ion mode. For fragmentation studies, analytes were infused directly into the MS through a syringe pump at a flow rate of 10 μL/min. MS conditions were optimized to obtain the highest intensity of the ions of interest. For LC-MS/MS, MRM of the ion transition of limaprost (1a) in the negative ion mode (m/z 379.2 → 299.2) and of the choline derivative (3a) in the positive ion mode (m/z 465.6 → 388. 4) were compared. The optimized MS parameters are shown in Table 1. The coupling reactions of limaprost with amine derivatization reagents 2a-2e produced high yields of derivatives in 1 h. In contrast, incubation of limaprost with 2a or 2d under the same conditions in the absence of HATU produced neither condensation products with carboxylic acids or ketone groups nor a Michael addition product. Of the limaprost derivatives, 3a gave the highest signal intensity which was 13 times greater in the positive ion mode than that given by limaprost in the negative ion mode (Fig. 1). The MS2 spectrum of [3a]+ (m/z 465.6) reveals a series of specific product ions including ions at m/z 406.5, 388.4, and 370.4. The MS3 spectrum of m/z 406.5 contains ions at m/z 388.4 and 370.4, of which the latter is present in the MS3 spectrum of m/z 388.4 (Scheme 3). Common features of the major fragment ions are as follows: (a) They all contain the analyte moiety namely limaprost; (b) they are all formed by loss of a neutral NMe3 molecule, the peak of [NMe3+H]+ (m/z 60) being detected in the MS2 scan of 3a; and (c) the formal positive charge is retained during interconversion conditions and transfers to the next generation. Loss of NMe3 is easier than loss of the first water since the product ion [3a-NMe3]+ (m/z 406) is present but [3a-H2O]+ (m/z 447) is not. The most intense signal is due to the product ion [3a-NMe3-H2O]+. Loss of the second water involves a 1  sigma-tropic rearrangement  and has a higher energy barrier for double bond migration such that the signal of [3a-NMe3-2H2O]+ is therefore the weakest. Possible fragmentation at an alternative site, such as between C14-C15 and C15-C16 in PGs [9, 25] was investigated using deuterium-labeled limaprost (1b). In the MS2 spectrum of [d3-3a]+ (m/z 468.5), all corresponding deuterium product ions [d3-3a-NMe3]+ (m/z 409.5), [d3-3a-NMe3-H2O]+ (m/z 391.3), and [d3-3a-NMe3-2H2O]+ (m/z 373.4) were present. From the fragmentation of 3b and 3a, it is expected that an analogous fragmentation will occur for 3c. The MS2 spectrum of [3c]+ (m/z 573.6) was acquired and showed a set of product ions with m/z 555.5, 537.5, 457.4, 388.3, 370.4, 211.2, and 168.0. Among these, the ions at m/z 537.5, 388.3, and 370.4 were observed as product ions in the MS3 spectrum of m/z 555.5, and the ion at m/z 370.4 was found in the MS3 spectra of both m/z 537.5 and 388.3 (Scheme 8a). As in the MS2 spectrum of 3a, the formation of [3c-Me2N(CH2)3SO3H-H2O]+ (m/z 388) and [3c-Me2N(CH2)3SO3H-2H2O]+ (m/z 370) was reproduced in the MS2 spectrum of 3c along with the amine fragment [Me2N(CH2)3SO3H+H]+ (m/z 168.0). However, in the case of 3c, the loss of the first water appeared to be the easier, because the dehydration fragment, [3c-H2O]+ (m/z 555), was found but with no trace of [3c-Me2N(CH2)3SO3H]+ (m/z 406). The fragmentation of Me2N(CH2)3SO3H takes place prior to the loss of the second water. The two fragments, [3c-2H2O]+ (m/z 537) and [3c-Me2N(CH2)3SO3H-H2O]+ (m/z 388) were both present with the formation of m/z 388 being preferred. There is no alternative C–N bond cleavage to form [3c-BuSO3H+H]+ (m/z 451), but a weak signal due to C–S bond homolytic cleavage to form [3c-2H2O-SO3H+H]+ (m/z 457.4) (Scheme 8b) was present as previously reported . Since all the examples above involve loss of an NR3 fragment, a different example is needed to explore what happens when the quaternary ammonium group cannot be eliminated. A pyridinium reagent 3e was therefore prepared. The MS2 spectrum of [3e]+ (m/z 485.6) included signals due to [3e-H2O]+ (m/z 467.3), [3e-2H2O]+ (m/z 449.6), and two smaller fragments at m/z 121.1 and 107.2 (Scheme 10a). The fragmentation of the pyridinium species was in agreement with the literature [13, 14]. While the positively charged nitrogen in the pyridine ring cannot be eliminated, it makes the para-position more susceptible to nucleophilic attack . Thus, the positive charge is effectively stabilized through resonance as in the Meisenheimer-Wheland complex (Scheme 10b). In this case, increasing the collision energy leads to total decomposition without providing any further information. A key feature of the two stabilized positive charge models is the role played by the amide nitrogen. To investigate this, a choline ester derivate 3f was prepared using a standard esterification reaction involving 1-(3-dimethylaminopropyl)-3-ethylcarbodiimide hydrochloride (EDC), DIPEA, and catalytic 4-dimethylaminopyridine (DMAP). The MS2 spectrum of [3f]+ (m/z 466.5) did not exhibit a dominant product ion since both [3f-H2O]+ (m/z 448.4) and [3f-NMe3]+ (m/z 407.4) were identified. Analogous to 3a, the MS2 charge migration in 3f can also be explained by formation of a cyclized intermediate [9, 31]. The interchanges between [3f-NMe3]+ (m/z 407.4), [3f-NMe3-H2O]+ (m/z 389.3), and [3f-NMe3-2H2O]+ (m/z 371.5) were examined (Scheme 7a). The signal intensity of [3f-H2O]+ (m/z 448.4) was too weak to be subjected to MS3 analysis. Another group of ester breakdown fragments were found, namely [3f-choline-2H2O]+ (m/z 327.4) and [choline 2f]+ (m/z 104.2) (Scheme 7b). Such fragmentation was not observed for the amide derivatives 3a-e consistent with the ability of the amide nitrogen to enhance the stability of the intermediate. Finally, derivatives incapable of forming the same positively charged intermediates as formed from 3a-c were investigated. To do this, the traditional derivatization reagent, Girard reagent T, was selected and coupled to 1a. The MS2 spectrum of [3d]+ (m/z 494.6) contained product ions with m/z values of 476.3, 435.5, 431.4417.5, 413.5, and 399.3. Fragmentation of [3d]+ (m/z 494.6) was similar to that of 3f, and the interchange between [3d-H2O]+ (m/z 476.3), [3d-NMe3]+ (m/z 435.5), [3d-NMe3-H2O]+ (m/z 417.5), and [3d-NMe3-2H2O]+ (m/z 399.3) was verified (Scheme 9a). Based on these experimental results, loss of the NMe3 group from 3d is not as convenient as from 3a and is comparable with the situation in 3b. As a consequence of the structural restriction imposed by the Girard reagent T moiety, a six-membered ring structure can be postulated. A conventional condensation product of the reaction of the Girard reagent T with the carbonyl group of limaprost was therefore prepared using Zhu’s protocol . This showed a strong dehydration product ion with no signal due to neutral mass loss (Scheme 9b). This indicates the key role of the amide carbonyl group in the formation of stabilized cationic product ions. A set of derivatives was prepared to investigate the mechanism of formation of stable positively charged fragments. Since different limaprost derivatives exhibit different fragmentation patterns (Fig. 2), an internal energetic scale is required so that the tendency to dissociate and likelihood of formation of different positive fragment ions can be evaluated . Using the survival yield concept [34, 35], the stepwise dehydrations are suitable to provide this internal energy distribution scale for limaprost and its derivatives. By fitting all the CID-MS/MS data for neutral loss to such an internal energetic scale, a regular behavioral rule can be discerned. With the help of Table 2, the stabilized product ion most likely to form can be easily recognized, namely the one derived from 3a. Using different substituents on the quaternary ammonium nitrogen, the formation energies of the stable positive product ions manifest themselves. This range of formation energies will potentially assist the selection of suitable derivatization reagents for the analysis of various lipid acids in the future. The derivatization of limaprost with quaternary ammonium compounds is reported for the first time. The ESI efficiency is improved by derivatization, and the positive ion signal intensity of limaprost derivatives is as much as 13 times greater than the negative ion signal intensity of limaprost itself. Neutral mass loss and formation of stable positive fragments containing the limaprost residue were observed enabling highly sensitive and specific MRM detection of limaprost derivatives. The formation of stable product ions is attributable to the effects of the adjacent heteroatoms and leaving group effects. The sequential elimination of two water molecules from limaprost derivatives (3a-f) was utilized to formulate an internal energetic scale for evaluating product ion formation after neutral mass loss according to the survival yield concept. Since quaternary ammonium groups with different substituents require various energetic ranges for the production of stabilized positive charges, this energetic scale may be useful in selecting derivatization reagents for the analysis of a wide variety of lipid acids. The authors gratefully acknowledge financial support from the National Natural Science Foundation of China (Grant Nos. 81430087 and 81673396) and the Science and Technology Major Specialized Projects for “significant new drugs creation” of the 13th 5-year plan (2017ZX09101001).